With yet another brilliant start in a 4-1 win in Tampa Bay on Friday night, Giants’ starter Madison Bumgarner made a little bit of franchise history. The lanky lefty is currently on a nine-start streak of pitching at least seven innings while allowing two earned runs or less. That stands as the second-longest in franchise history, behind Ferdie Schupp of the then New York Giants, who had 12 such starts between the 1916 and 1917 seasons. 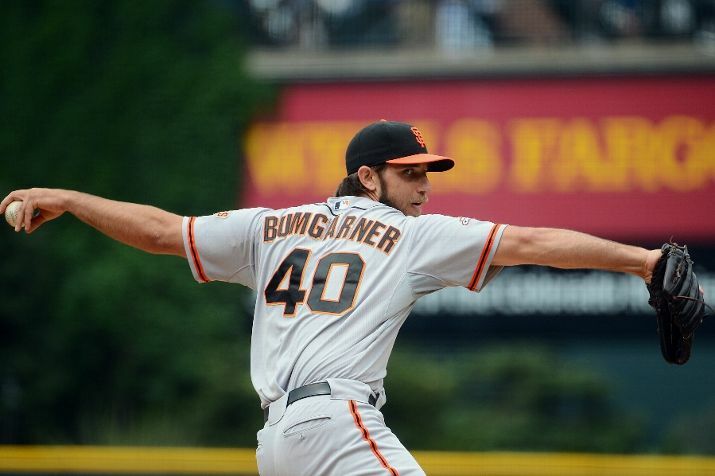 This impressive streak has not only produced the lowest ERA of Bumgarner’s young careeer (2.69), but it’s also planted the 24-year-old firmly in the middle of the Cy Young race. The Giants’ de facto ace is showing no signs of slowing down either, especially after tying his season-high in strikeouts with 11 against a baffled Rays lineup. He was clinical with slider, throwing the pitch a season-high 53 times with an impressive 35 of those tosses going for strikes. That’s been par for the course for Bumgarner this season because no pitcher in baseball favors his slider as much as the Giants’ lefty. After carving the New York Yankees batting order up for 7 innings, Matt Moore figured that his night was probably over because he was already sitting at 105 total pitches. But Tampa Bay manager Joe Maddon had other ideas, running his 23-year-old ace back out to the mound to face the Yankees in the 8th. Maddon’s faith was rewarded with a clinically dominant inning from Moore. The left-hander shut that Yankees down 1-2-3, needing just 12 pitches to do so before yielding to the bullpen for the 9th inning. 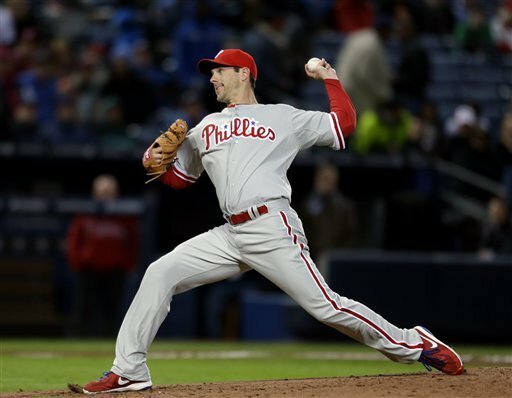 Moore finished the game with a beautiful stat line for a pitcher: 8 innings, 1 run allowed on just 2 hits, with 9 strikeouts to go against 3 walks. The only Yankee hitter that didn’t look completely overwhelmed at the plate was all-world 2nd baseman Robinson Cano, who had the Yankees 2 hits on the day. Yu Darvish had the best start of his young career last night against the Yankees, tossing 8.1 beautiful innings, striking out 10 batters in a 2-0 win. Darvish threw everything plus the kitchen sink at the Yankee batters, keeping them off-balance and uncomfortable and the plate. Darvish stayed around the plate all night, walking a season low 2 batters and scattering 7 hits. Yu got his run support on a leadoff homer by Ian Kinsler and a 3rd inning 2-out RBI single by Josh Hamilton, and he was able to make both runs stand up. 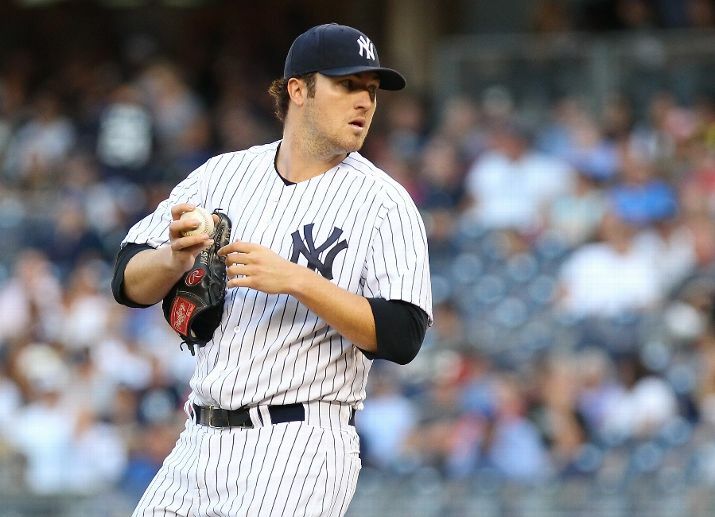 His location was excellent and his wide array of pitches baffled the Yankee hitters. Darvish also isn’t afraid of using any pitch in any count, striking out hitters on his splitter, his curveball, his slider, and fastball. If you look at his pitch breakdown he threw 42 fastballs, 20 sliders, 7 curveballs, 27, cutters, 9 splitters, and 14 2-seamed fastballs. Even when Darvish was missing with his pitches, he was down and outside of the strike zone, where no hitter can do any damage. Yu throws each of these pitches in a variety of locations and at a variety of speeds. Last night he was moving his fastball velocity up-and-down between 90 mph and 97. His performance was impressive and generated a lot of awkward swings out of the hitters. Yu was also intelligently exploiting the left side of the plate against the Yankees, because home plate umpire Ted Barrett was giving both pitchers a large corner on the left side of the plate. This is intelligent pitching and made the Yankee at-bats even tougher, because they had to protect more of the plate. The splitter he was using last night was thrown slightly differently than any splitter I’ve seen previously. Darvish left his ring finger knuckle high up on the baseball and then split his middle and index fingers around the seams. The pitch was thrown in the mid-80s with sharp downward break that fooled the Yankee hitters. In the 2nd inning of his start he retires Nick Swisher with the pitch, and boy is it a nasty one. Darvish also showed a solid ability to get out of a jam. In the top of the 3rd the Yankees were able to get a rally going, loading the bases with nobody out after a pair of singles surrounding a walk. Darvish then kicked things up a notch, striking out Curtis Granderson and inducing an easy double play ball on weak contact by Alex Rodriguez. The best pitchers are able to limit the damage an offense can do when it gets runners on, and Darvish displayed this ability in spades last night. In fact, the only Yankee hitters who had any good swings against Darvish were Derek Jeter and Robinson Cano, who both doubled. Jeter is one of the 3 to 4 hottest hitters on the planet right now, with his average up to .416 after his 2-4 night, and Cano is-and-has been one of the best hitters in baseball for the past 3 seasons. 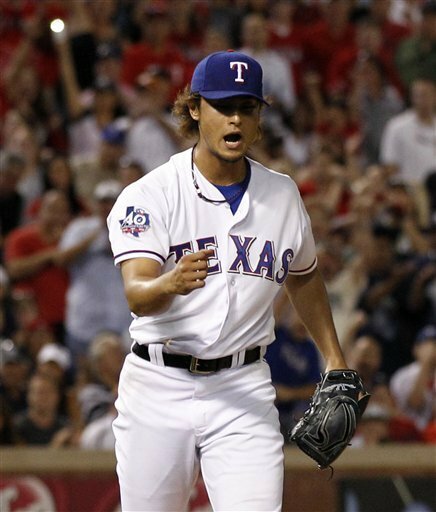 Darvish has now made 4 starts for the Rangers and has hardly disappointed. 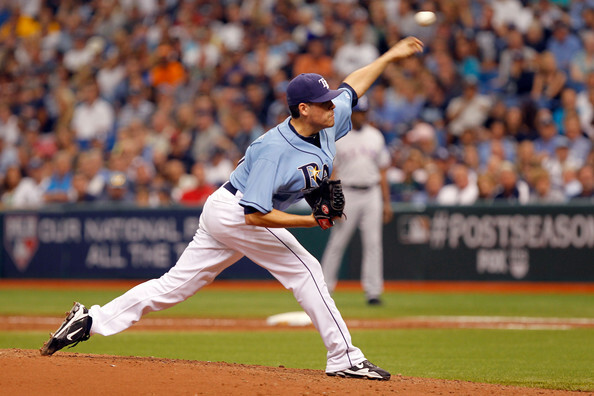 He has pitched 26 innings, compiling a 3-0 record while striking out 24 batters and posting a 2.42 ERA. He hasn’t allowed a homer and has gotten better in each of his starts, which is a scary thought for the league. His only issue has been his control walking 15 batters, 2nd most in baseball, but if his start against the Yankees is any indication, it won’t be an issue. If he can keep his early control problems in check, and display the command he had against New York, Darvish will be a solid contender to win the Cy Young. -Chipper Jones turned 40 yesterday and celebrated with a bang, pounding a homer deep to right field in a 4-3 Atlanta win. -Jeff Samardzija and Adam Wainwright met for the 2nd time this season and a pitcher’s duel ensued. Samardzija continued his excellent campaign, going 6.2 while striking out 9 and allowing no runs. Adam Wainwright also pitched well, going 6 innings, allowing 1 run and striking out 7. This was his best start of the season so far, and should be an encouraging sign for the Cardinals. As for the outcome of the game, Chicago was able to win in extras 3-2 on what should have been an error awarded to Tyler Greene, but was instead ruled a single for Alfonso Soriano. -Tommy Milone also continued his excellent start to the season out in Oakland, throwing 8 innings of excellent baseball in a 2-0 win. He moves his record to 3-1 on the season after allowing only 3 hits while striking out 5 White Sox. His ERA on the season is now an even 2.00 and he is posting an elite 0.852 WHIP. He doesn’t strike out many hitters, but Milone does a good job keeping batters off balance at the plate while still pounding the strike zone. -Josh Collmenter was bombed once again out in Arizona, this time by the struggling Phillies offense in a 8-5 loss. Collmenter has now allowed 20 earned runs and 30 base runners in 18.1 innings of work. He is a soft-tossing righty, who’s velocity usually sits around 86-88 with an average curveball and change-up, and now in his 2nd season, Collmenter’s stuff just doesn’t seem to be fooling batters anymore. He’s already leading baseball in homers allowed as well, having given up 6, and Arizona has plenty of talent in the minor leagues, with Trevor Bauer and Tyler Skaggs destroying minor league batters, so its going to be interesting to see if the Diamondbacks make a rotation move sooner rather than later. Arizona would probably be able to add a couple wins to their overall total if they call up one of the young flamethrowers in the next few weeks, rather than let Collmenter’s soft tossing act continue to bomb for a couple more months.